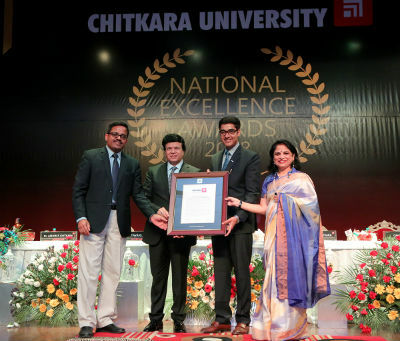 Chandigarh: Today, Chitkara University announced the first edition of Chitkara University National Excellence Award – 2018. The excellence award is an endeavour to acknowledge and reward the exceptional work and contribution of trailblazers from different spheres towards education and society. In a glittering ceremony, Chitkara University conferred Mr. Manish Sharma – President and CEO Panasonic India and South Asia, Vice President Appliances Company with “Chitkara University National Excellence Award” owing to his inspirational journey as a role model in business and his exemplary contribution towards education and humanity. Mr. D.K Tiwari (IAS) – Secretary, Expenditure (Department of Finance) & MD/ PIDB (Punjab Infrastructure Development Board) was the chief guest for the occasion. Mr. Manish Sharma humbly accepted the recognition from our esteemed chief guest in the presence of Hon’ble Chancellor-Dr. Ashok. K Chitkara, Vice-Chancellor-Dr. Madhu Chitkara and the entire Chitkara fraternity. Addressing the Gen Next of Chitkara University, Mr Manish shared that Panasonic celebrates this 100 years of the establishment in 2018, started out as a pioneer in light bulb sockets. Who knew that decades later, this Japanese giant who usher the light in the electronic revolution that would be the reflection of an economically advanced and socially enhanced India. Mr. Manish Sharma talked about brand Panasonic’s consumer, enterprise, mobility & industry divisions. Mr. DK Tiwari IAS , shared his Administrative experiences with the Students and telling them to be a part of the system if they want to see the change in the system. He told them to be responsible citizens and contribute in their own way to the society. Speaking on the occasion, Dr. Madhu Chitkara – Vice-Chancellor, Chitkara University said, “Chitkara University Excellence Award is a humble effort to distinguish and honour the most respected leaders from a variety of industries. These leaders have not only contributed to their respective fields but have also become role models for many. Students look up to them and aspire to become like them. The excellence award is a small token of appreciation for their creativity, commitment, experience and strong leadership”.